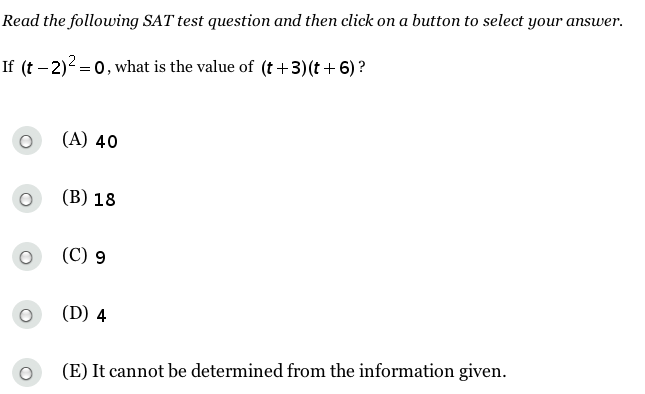 Today’s question of the day from the SAT website. See answer below to find out if you’ve still got your 10th grade math chops. As anyone who took the ACT or SAT tests remembers, shortly after you get your scores, your mailbox is flooded with brochures, pamphlets, and catalogs from schools that want your tuition money. This isn’t a coincidence, as The College Board and ACT, Inc. — the companies behind these tests — sells test-takers’ information to colleges. But a new lawsuit alleges that this practice is a breach of contract as it’s done without the test-takers’ consent. The suit, filed this week in a federal court in Illinois, claims The College Board and ACT, Inc. charge a fee per student on each sale of personally identifying information — names, home addresses, birth dates, phone numbers and social security numbers — but fails to disclose to those taking the test that their information will be sold to marketers for a profit. While the lawsuit puts the value of that fee at $.33 per student per request, Philly.com reports that the price for this information has gone up recently, with The College Board now charging $.37 per request and ACT demanding $.38 each. There are ways for students to avoid having their information sold — the SAT requires test-takers to opt-in to having their information shared while ACT takers must opt-out of having their info sold. The lawsuit claims both companies are “masking the sale” of the information under the guise of information-sharing. The question is whether or not test-takers would let their information be shared if they knew it was being sold for a profit. The suit alleges consumer fraud and deceptive business practices, breach of written contract, invasion of privacy and misappropriation of confidential information, and unjust enrichment.